Samtengang Trekking, Bhutan trek | Unique Nepal Adventure Treks & Expedition Pvt. Ltd.
Samtengang Trekking is a short and pleasant journey from Punakha to Wangdue Phodrang Dzongkhag. It is a fairly easy trek as the altitude only ranges between 1100 and 1900m and the climate is warm throughout the trek. Samtengang Trekking path takes you through forests of rhododendron and oak, through the villages of Sha and Chungsakha and across the longest foot bridge in Bhutan. While this trek is available throughout the winter the best times to embark on it are between March and April and September and October. The trail is approximately 54 km in length. Samtengang Trekking takes in a visit to the awe inspiring Taktsang Monastery (Tigers Nest) and to visit a Lhakhang and three other Dzongs in Paro on arrival. 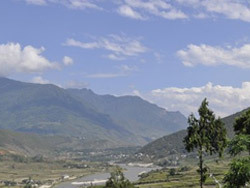 The trek also takes in sightseeing in the capital Thimphu and the ancient capital Punakha. This trek can be customised to suit your needs. After breakfast we drive to Punakha and on the way we stop off at the Dochu La pass and on a clear day enjoy the breathtaking scenery. We then drive on and visit Chimi Lhakhang, which was built in 15th Century (dedicated to Lama Drukpa Kuenley also known as “The Divine Madman”). It is a pilgrim site especially for childless couples and it is a half an hour walk across a local village and rice field. Everyone in this kingdom believes that the Lama’s blessings will help a woman conceive. Visit Punakha Dzong, which was the ancient capital until 1955. The remains of the Shabdrung (also known as Zhabdrung) the saint who unified Bhutan in the 17th century are interred here. The Je Khenpo, head abbot of the monk body of Bhutan, resides here with the monk body from Thimphu during the winter because it is warmer at this altitude. Spend the rest of the day sightseeing and souvenir shopping. Stay overnight at a hotel. Distance 12 km, 4 hours, 880m ascent, camp altitude 1980m. After passing the majestic Punakha Dzong, you cross a footbridge over the Pho Chhu and walk up to Shengana. This is the longest bridge in Bhutan. You then climb gradually through the forest until you reach Limukha. Make sure you are carrying enough water, as you will not find any on the way to Limukha. Distance 14 km, 5 hours, 430m descent, camp altitude 1550m. The path leads through rhododendron and oak forests to Chungsakha. Chungsakha is a small village of about 10 houses. You will find a holy stone and an impressive Cyprus tree here that are reminders of Drukpa Kuenley, “The Divine Madman”. Distance 13 km, 5 hours, 650m ascent, 270m descent, camp altitude 1830m. Distance 15 km, 5-6 hours, 730m descent. The trail leads steeply downhill on a treeless slope to the road head at Chuzomsa. Your car will be waiting to transfer you to Thimphu, which will take about three hours. Cross the Dochu La pass (3116m) and if the weather is clear, you will have beautiful views of the snow-capped mountains. Stay overnight at a hotel. After breakfast we will visit the following places: Memorial Chorten (a huge Stupa) built in memory of the third King who reigned the Kingdom from 1952 – 1972. The National Library where ancient manuscripts are preserved. Visit Tashichho Dzong. This is the main secretariat building. This massive structure houses part of the government ministries, office of the King and the Throne Room. It also houses the State Monastic Body and the living quarters of the Chief Abbot and senior monks. After lunch we will visit Simtokha Dzong. This is one of the oldest fortresses in Bhutan, which was built in 1629 AD by Shabdrung Ngawang Namgyal. Visit the woodcraft and painting school where traditional art and crafts are still kept alive. Visit the handicrafts emporium where Bhutanese textiles and other arts are displayed and can be purchased. If time permits, we drive 14 km to the north of Thimphu to visit Tango Cheri Monastery. Stay overnight at a hotel in Thimphu. Drive back to Paro for two hours and do some sightseeing and shopping for some souvenirs. Stay overnight at a hotel. Accommodation in a hotel in Paro, Thimphu and Punakha. Return transportation from Paro to Thimphu and Punakha by private vehicle.